First established in over 25 years ago, A Rated Windows & Carports has supplied numerous quality products to countless satisfied customers. Based in the South West of England, A Rated Windows & Carports offers an incredible selection of products, including canopies, all over the UK. 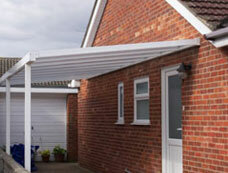 Their extensive canopy range includes door canopies, glass canopies, budget canopies, timber door canopies, acrylic door canopies, and GRP door canopies. Canopies are ideal for a whole range of uses for both homes and businesses, and with A Rated Windows & Carports you are offered an incredible range of designs for you to choose from, so to be in keeping with your property's aesthetic. As well as canopies, A Rated Windows & Carports offer a range of other products, which includes pop up gazebos, carports, doors, windows and conservatories, and their product range is still growing so giving you a fantastic selection for you to choose from. "An ever-growing product range of quality canopies"
A Rated Windows & Carports aim to ensure with each product incredible quality with fantastic affordability; therefore, A Rated Windows & Carports carefully select each of their products to ensure they are providing a lasting solution.